The Stall-Alarm Mobile Livestock Security concept was born out of necessity. The owner of Stall-Alarm (and our parent company, Security Safe Company) is JOE PEURRUNG. He and his family would definitely be characterized as "horse people" -- competing in barrel racing events all over the southeastern U.S., and traveling nearly every weekend. Throughout the family's travels and various competitions, Joe became aware of the fact that at many large-scale events people were having their prize horses being stolen from the temporary trailer stalls they were being housed in at the events. Unfortunately, this is becoming a more and more common occurance and is a growing trend. Sometimes it may be many hours before the owners become aware that one (or more) of their horses is missing -- by which time the thieves are long gone. Concerned about the safety of his own horses, Joe decided to become proactive and create a solution to this ever-increasing problem. Collaborating with his senior Technical Staff members, the prototype Stall-Alarm system was created. From there, Joe carried it to every event in which his family participated, and used it to protect their four horses. After a period of evaluation, some of the design aspects were refined -- making the system more sturdy, and easier for the end user to install. The end result is an easy-to-install mobile security system for your horse trailer stalls that is dependable, durable and tamper-proof -- designed by a gentleman with over 20 years of experience in the Security Industry. 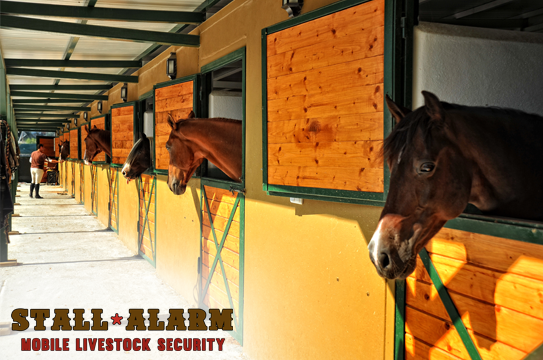 If protecting your horses is as important to you as it is to Joe, then use his experience and expertise to your advantage and protect your horses while on the road with one of our new Stall-Alarm Mobile Livestock Security Systems.